Granite is actually a combination of quartz, mica and feldspar. 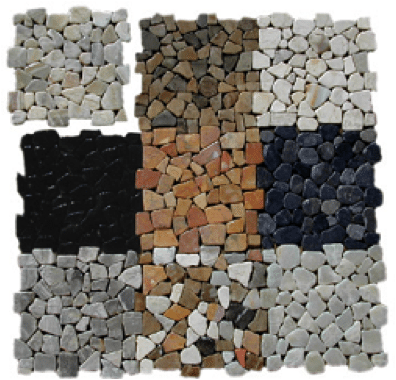 Engineered stone is 93% quartz based on weight; the rest is a mix of resin, glass, dyes ect. It starts off as a powdered mix and is pressed into slabs. While there are several brand names of engineered stone on the market today, most are generally made using the Breton machinery. Additionally the same colors of quartz crystals are used in all brands, and the different shades of material are actually achieved through dyes. Engineered Marble is also available with characteristics similar to natural marble. They are going to do all the things that natural marble does, it will etch. The myth that granite harbors bacteria is just that. You cannot get customers to believe this. Bacteria need a food source. It can’t eat granite. If you are going to be a messy housekeeper and leave food out on the counter, you will get bacteria no matter what type of countertop you have. Many tests have been conducted over the years to prove the cleanability of granite. In particular, there was a test that was performed by the Hospitality Institute of Technology and Management. The first cleaning was done with soap and water. Granite had the biggest reduction in germs. In terms of cleanability, granite is very good. It is very dense. While it should be a known fact that granite is a natural material and therefore has color variation and veining, it should be pointed out that there is some color variation with engineered stone as well. It’s better than granite, but not a perfect product. You have to make your customers aware that it is not perfect. Between lots, there can be a total variation. Another interesting fact was the temperature tolerance of both granite and engineered stone. Granite can hold 2,000+ degrees. You can put a hot pot on it. I have seen where a house burned, and people went in and salvaged the granite and cleaned it. On the other hand, the resin in engineered stone melts around 400 degrees. The problem with engineered stone is still the same with solid surface, cooling and expansion. It will create blistering. You can actually set engineered stone on fire with a blow torch. There is a difference between the gloss of granite and the gloss on engineered stone. Engineered stone doesn’t get as high of a degree of polish, and this sometimes can be disappointing to a customer. There is definitely a visible difference in polish between the two. In our opinion, both are good products. I wouldn’t sell engineered stone if I didn’t think it was a good product. It fills a void for people who want consistency. Look at any new up-scale home or remodel…..The kitchen and the bathrooms shine forth as the most important rooms in the house. Some of that shine is coming from the beautiful natural stone countertops. And there are many reasons that granite and other natural stones are the most popular up-grades one can make to a home. For shear un-matched beauty, natural stone is by far the choice of most homeowners. The fact that each slab of stone is individually carved from the side of a quarry, shipped from some far-away place, and then custom cut and polished specifically for their kitchen, bathroom, or fireplace makes shopping for that perfect piece of rock exciting but sometimes a little confusing. There have been some misleading articles circulating over the past few years that try and discourage using Natural Stone for kitchen countertops. Stating concerns about granite being difficult to care for, too expensive, easily stained or grow bacteria from food products, or even emitting un-safe amounts of radon gas. The facts show that Granite is not only easy to care for, it is less expensive than most comparable surfaces when you consider that it will last the life of the house. And there are many advantages to granite that make it well worth the investment. As far as food stains, bacteria, and radon gas emissions….well let’s just say that sometimes rumors get conveniently spread from competitive countertop manufacturers. Here are a few areas of interest you may want to think about when you are considering what type of surface to use for your countertops. The Marble Institute of America has called upon several of the country’s leading scientists in geology and geochemistry to assist in preparing a response to the allegations in these articles that radon gas emissions from granite countertops may be hazardous. On reading the article, our consultants reacted with such comments as “ludicrous”, “a fabulous collage of nonsense”, “politically motivated”, “unethical” and “bizarre”. In terms of building materials, radon emissions from concrete, cement and gypsum could be of greater concern. If you are concerned about bacterial contamination of your kitchen countertop, it looks like stainless steel and granite are the way to go. That’s what a recent study by the Hospitality Institute of Technology and Management, a St. Paul Minnesota-based organization that develops educational materials and research for the retail food industry shows. The study measured the bacteria resistance capacity of six common countertop materials. Each surface was contaminated with E-coli (nearly 2 billion of the microorganisms), washed and rinsed with soap and water and then sanitized with a vinegar-and-water solution. The results are shown in the table below. Natural stone will continue to be recognized for its un-matched beauty and versatility and is considered by most to be the best quality material available for your countertops. In the past few days, a television video has circulated online that has created widespread consumer confusion and concern about radiation levels occurring in natural granites used for residential countertops. The report suggests some countertops may pose health risks, ignoring years of legitimate and independent scientific research that has concluded that natural stone is perfectly safe to use in homes. It’s outrageous that manufacturers of synthetic stone countertops would use a front group like this to scare consumers. It is also alarming that manufacturers of a competing product feel they can only compete by groundlessly creating fear about natural stone, which is safe, beautiful and superior. The truth of the matter is that granite is a safe product. It’s been used for thousands of years and the relationship between granite and radon has been studied for years and years. How safe is granite? There have been mathematical models developed that show that one could live in an all-granite home or building, including sleeping on granite, for an entire year and still be within very safe levels of exposure. Nonetheless, the Marble Institute of America has produced a brochure to help you understand granites, radioactivity and natural stone. All rocks have a small amount of radioactivity in them due to the presence of minerals that contain radioactive elements uranium, thorium and potassium. Because granite typically contains more of these elements than most other rocks, it will be more radioactive than a slate or marble. A. Radiation is energy that is transported as waves or particles. This includes visible light, infrared, ultraviolet and microwaves. Q. What are the sources of nuclear radiation? A. There are natural and man-made forms of radiation. Natural radiation includes cosmic radiation and emissions from radioactive elements in the earth, radon gas in your home, some foods and well water. Man-made radiation comes from dental x-rays, medical diagnostics and treatment, the remains of nuclear bomb testing, emissions from nuclear reactors, radioactive elements in drywall and concrete and cigarette smoke. The pie chart included in this brochure shows the approximate contribution of each of these to your annual radiation dose. Q. What about food that is prepared directly on the granite surface? Is there a chance that it could absorb radioactive energy, which later would be ingested by those eating the food? A. The only way that radioactive elements such as uranium can get into the food is if they became dissolved in water and absorbed in the food. However, granite is one of the most insoluble materials known to man and the amount that could be dissolved is miniscule in comparison to the radioactive elements that are already in the food (in meat or from uptake by soil or air-born particles during growth). Radioactive energy given off at the granite surface will enter food that is directly in contact with the surface but, like all energetic rays, it changes into heat and/or non-radioactive particles. These processes happen quickly so the radiation does not remain in the food. It’s in the air we breathe, in the water we drink, in the soil and rock we stand on, and in the sun’s rays we like to bask in! 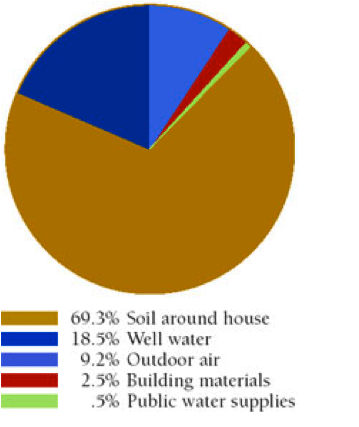 Added to this is the radiation we get from man-made sources, such as x-rays, medical treatments, building materials, etc. From what we know, there are two ways in which countertops, tiles and other finishes made of granite might emit any level of radiation. The first is by the release of tiny amounts of the radioactive gas radon which can be inhaled. The second is by direct radiation from the surface itself to the homeowner. In both cases, the radiation emitted is from the same process – natural radioactive decay of one element into another. Compared to other radiation sources in the home and outside, the risk to the homeowner from radioactivity emitted from a granite countertop or tiles is practically non-existent. In fact, the amount of radon gas emitted by a granite countertop is less than one millionth of that already present in the household air from other sources. In the seminar “Working with Engineered and Natural Stone Countertops,” which was held during StonExpo East in Atlanta, GA, earlier this year, Duane Naquin of Stone Interiors and Jessica Rose of G&L Marble, Inc. provided facts on the pros and cons of each material as well as diminishing any myths about each. They spoke to a full room of fabricators, who listened intently and asked questions. Naquin went on to explain that engineered stone is 93% quartz, based on weight; the rest is a mix of resin, glass, dyes, etc. “It starts off as a powdered mix and is pressed into [slabs],” he said, adding that while there are several brand names of engineered stone on the market today, most are generally made using the same Breton machinery. Additionally, he said the same colors of quartz crystals are used in all brands, and the different shades of material are actually achieved through dyes. Additionally, the issue of color matching was also addressed. While it is a known fact that granite is a natural material and therefore has color variation and veining, Naquin and Rose pointed out that there is some color variation with engineered stone as well. A question was raised in the audience asking if putting a hot pot on a granite countertop would affect the sealer, and Naquin answered that it would not. With regard to engineered stone, another fabricator asked if the material can be faced polished. Naquin explained that it is very difficult because of the heat factor. During the seminar, it was also mentioned that there is a difference between the gloss on granite and the gloss on engineered stone. Rose explained that engineered stone doesn’t get as high a degree of polish, and this sometimes can be disappointing to a customer. “There is definitely a visible difference in polish between the two,” she said. On the other side, engineered stone will have more seams than granite — although Naquin was quick to point out that there will still be seams in granite. “Before the invention of engineered stone, the solid surface industry promoted ‘no seams,’ “ he said. “They backed off now because engineered stone has seams. It has a greater flexural strength than granite. We are now offering tiles for our customers. In our showroom we are displaying ceramic tiles from Florida Tile and Dal Tile. We are also showing glass tiles from different manufactures. Another popular item that we offer is natural stone in multiple sizes and porcelain tiles with the look of tumbled marble. If you are looking for a custom painted mural, decos, to match wallpaper or your own custom design, we also offer that service to you. If you are interested in a mural we will produce a pencil drawing for your approval. You can provide a color pallet for us to work from. We work closely with a couple of very talented and reliable tile setters that will install the tiles you have chosen. Please feel free to give us a call or stop in for any questions concerning tile or countertops.